The USMCA was signed on Nov. 30, but has not received congressional approval yet and getting it through the legislative body will be tough for the administration. The deal has to get through the Democrat-controlled House and was criticized by Republican Sen. Chuck Grassley. The senator noted that tariffs on Mexican and Canadian goods should be waved off once a deal is ratified. Trump, however, has not indicated his willingness to do so. If the deal between the three countries falls through, the ramifications for the U.S. economy would be massive. Canada and Mexico are two of the U.S.’ three largest trade partners and made up 30% of U.S. global trade in 2018, according to data from the Census Bureau. The apparent progress in U.S.-China trade negotiations boosted stocks world stocks this year. 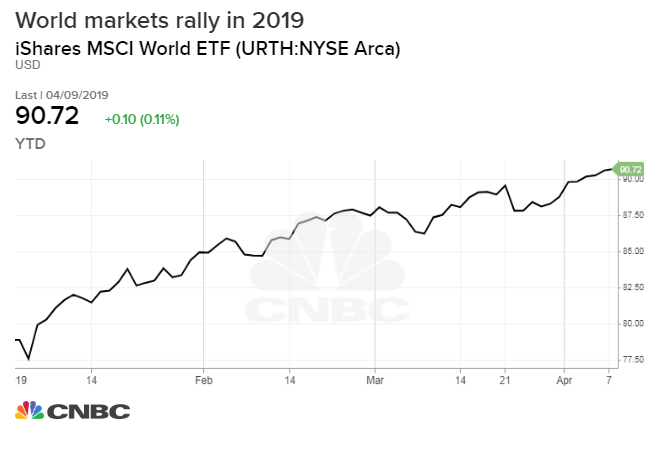 The iShares MSCI World exchange-traded fund (URTH) is up more than 15% in 2019. The S&P 500 has also rallied more than 15%. But failure to strike a deal would hurt the U.S. economically and would also derail the Chinese’s efforts to reinvigorate its economy, the IMF warns. China’s economy expanded by 6.6% in 2018, which was its slowest pace in nearly 30 years. The Federal Reserve reversed its stance on policy earlier this year, eliminating all expectations for even a single rate hike for 2019. This follows four rate hikes by the U.S. central bank in 2018. The Fed’s reversal contributed to the market’s hot start to 2019, with the S&P 500 notching its biggest first-quarter gain since 1998. -CNBC’s Jacob Pramuk contributed to this report.